In a previous post I described how the University of Waterloo fails its pedestrians. But UW’s problems go deeper. It was built as a suburban campus on farmland in the 1960’s and 1970’s — when it seems planners and architects were intent on planning for the car, even when designing a pedestrian-dominated place. Now that the campus is surrounded by the city on all sides and there is growing recognition that spaces need to be designed for pedestrians, it is important that it integrate well into its environment. However the campus street plan essentially does the opposite. Currently the main campus road, Ring Road, is accessed by vehicles only through two connector roads on the north and south. There are thus a high number of intersections for vehicles to contend with, and it is a roundabout trip to get in and out of the campus. My estimate is that most of the people travelling by motor vehicle on Ring Road are actually using transit. So the meandering is a waste of time particularly for bus riders and of money for Grand River Transit (as UW is a transit hub). But even though Ring Road is difficult to get to, it is wide open in many parts and even the few speed humps don’t suitably slow down car traffic. UW can be a pain to get to on foot from some directions, and difficult to navigate once you do. There are barely any pedestrian thoroughfares, mostly just paved paths (if that). In many cases, vehicular access roads serve as makeshift pedestrian corridors. All parking is surface parking, and there are lots right inside the main campus (bounded by Columbia and University). The current UW campus, based on an official map. Solid lines are roads, many with missing sidewalks. Dashed lines are pedestrian paths that are wide, specially paved, or otherwise deliberate. I propose a new University of Waterloo street plan. With contribution from Sylvan Mably, I’ve drawn what I think to be a much improved version of UW’s campus. The emphasis is on connectivity, navigability, and a street system that fits its use. This alternative street plan is ambitious but firmly rooted in what is actually feasible to do from the current situation. There would no longer be a Ring Road, and its east and west segments would be through streets. Moreover, both of these streets would connect with Seagram Drive at the south end of the campus, and part of the current Seagram alignment would be turned into a pedestrian thoroughfare (as it would not be a useful vehicular connection). 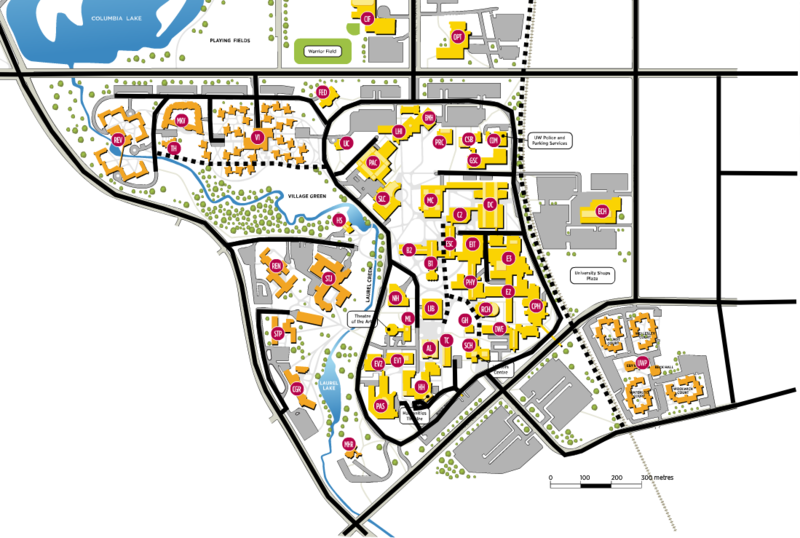 Other notable road changes are an extension of the current St. Jerome’s access road across Laurel Creek to the extended Seagram Drive, and a street connection for the west end of the student village. Good road connectivity would reduce the distance vehicles (including bicycles) need to travel to reach points of the campus. 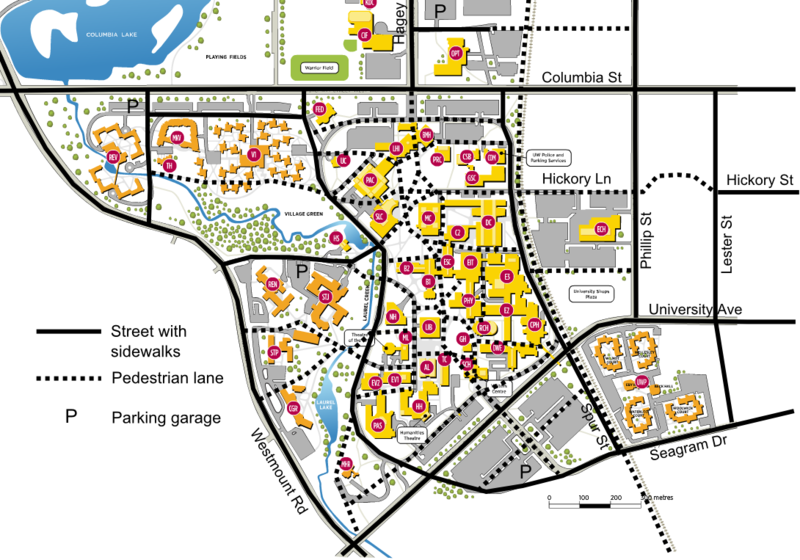 My proposed street plan for the University of Waterloo. The solid lines on the map would be streets with wide sidewalks and perhaps bike lanes. As the design of a road dictates how drivers use it, through streets inside the campus would be designed for low speeds (30 km/h). Where possible, they should have street parking with demand-responsive pricing; this would ensure that short-term parking is available when needed. The dashed lines are what I call pedestrian lanes. These are wide thoroughfares laid out with paving stones and designed for pedestrians, but shared with cyclists and the occasional intruding campus delivery van. These lanes should be named, especially the several that provide east-west routes and the north-south thoroughfare (which splits around the Grad House knoll and the Math & Computer building). With naming and a somewhat grid-like network of lanes and streets, the navigability of the campus would improve dramatically. Wayfinding and campus travel would become easier and more pleasant. Thanks to improved connectivity, the campus would be easier to access by walking, cycling, bus, and light rail (which will stop along the east side of campus). Most of the lanes follow existing paths, but some would need to be graded first and others would need to be created through current parking lots. A connection would be made between Lester and Phillip Streets to make Hickory Street/Lane a useful corridor across UW, through the Northdale neighbourhood, and past King Street. Two buildings would have to be sacrificed to open up the north and south pedestrian gateways to the campus. The more pressing one is South Campus Hall at the south gateway, and the current campus master plan actually calls for it to be demolished for this very reason. Endless construction has been steadily devouring what little open space UW’s main campus has left. There are currently grand plans afoot to develop distant parts of the University of Waterloo lands, possibly including academic buildings. My plan would allow well-located possibilities for street- and lane-facing campus buildings to accommodate growth, in particular at the parking wastelands in the north and south ends. UW is actually already haphazardly removing lots to put up new buildings. With my street plan there would be opportunities for well-located parking garages, e.g. by St. Jerome’s, off Seagram Drive, or by Columbia Street. It would also open up important possibilities for public space, such as around the south gateway to campus. Eventual demolition of some of the old three-story buildings in the center of campus (and replacement with taller, more compact ones) would allow for some much-needed central public space. This is intended to be food for thought, and is neither exhaustive nor definitive. 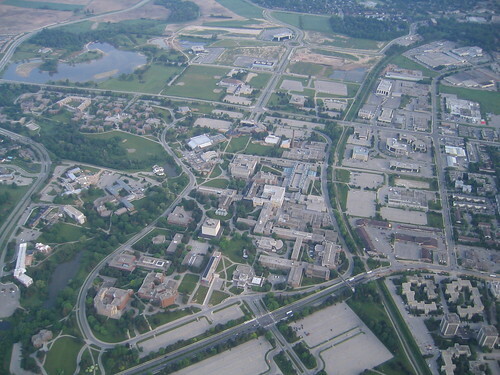 However, I strongly believe that a plan along these lines would dramatically improve the University of Waterloo’s walkability, connectivity, campus experience, and safety, and make it a better university overall.